This article first appeared in The Edge Financial Daily, on November 8, 2017. 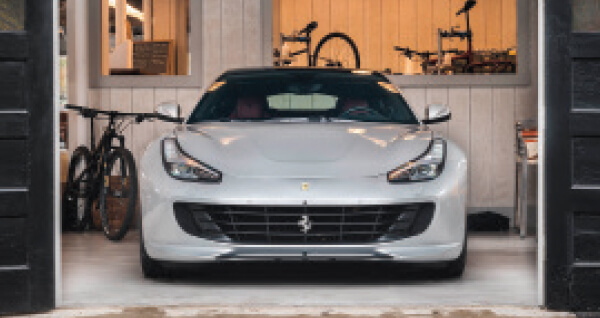 The Ferrari GTC4Lusso T is a four-seat, rear-wheel drive coupe. The GTC4Lusso T uses the same engine as the California T. It gets 602hp, or 78 fewer horses than its V12 counterpart. There are round gauges and dials throughout. The interior has four seats. THE 2018 Ferrari GTC4Lusso T is probably not the car you buy if you already own a Ferrari. The “T” is the turbo version of the GTC4Lusso with fewer cylinders but higher torque; a more-aggressive engine note; rear-wheel drive, and a lighter, wilder, more ethereal feel from behind the wheel in the best way possible. Where the GTC4Lusso is powerful, the new GTC4Lusso T is polished. Where GTC4Lusso is suited for inclement weather and uneven roads, the rear-wheel drive T version is best for showing off your newly acquired membership into the Italian exotics family, since it’s likely the first one you’ve owned. In fact, the GTC4Lusso T is the car you buy if you do not yet own a Ferrari. If you do buy it, you’re in for a treat. It is more thrilling to drive than its V12 counterpart. The GTC4Lusso T is Ferrari’s first four-seater with a V8 engine. This is significant because the brand has made its name with the aristocratic V12 derived from decades of Formula racing dominance. The older Ferrari contingent doesn’t settle for less. But the benefits of this 602hp, 3.9-litre V8 turbo are myriad: 760 newton metres of torque, a higher engine speed at idle (closer to those of actual race cars), better fuel efficiency, and unique sound when you rev. When you press the ignition button on this coupe, it starts with roar rather than a scream. What’s more, GTC4Lusso T (isn’t that the longest, most awkward name ever?) comes with a super-sooth, lightning-quick, seven-speed, paddle-shift transmission and four-wheel steering on that rear-wheel drive chassis. It is 110 pounds (49.9kg) lighter overall than its predecessor, too, with an increased weight bias (46% to 54%) towards the rear. This means that when you drive it, the car shoots forward like an ultralight rocket. It’s lighter to handle, more responsive to steering, and more nimble around corners than the GTC4Lusso. There’s also significantly increased throttle response — imagine razor-edge response time when you press the gas — and a lower body position over the chassis. Yes, even though it’s a turbo. From behind the wheel, the contact with the road in this car is noticeably, thrillingly nearer and dearer than in the GTC4Lusso. Did I mention this is the four-seater you should buy to drift? Because it will. Don’t ask me how I know. Zero to 62mph (99.78kph) is 3.5 seconds, or the same as the V10 Audi R8. Top speed is 199mph. Fittingly, this car also is substantially quieter inside than the now-archaic FF. Ferrari says it’s “55%” quieter, but that’s tough to quantify, isn’t it? The engine is louder in sport mode, by the way. Use it liberally. 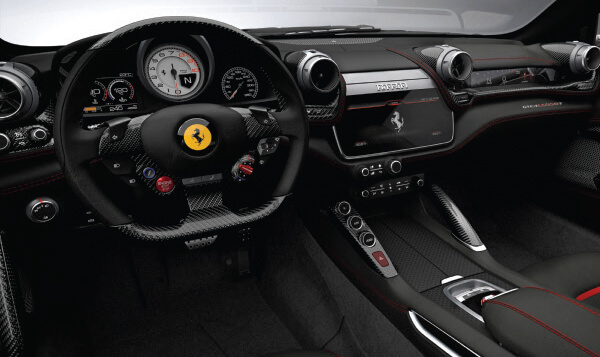 Otherwise, the interior resembles that of other four-seat Ferraris: A 10-inch (25.4cm)-plus touchscreen crosses the centre console, and round gauges, air vents, and cockpit buttons make you feel as though you’re the captain of some interplanetary vessel. The rear seat is small, but not nearly as confined as that of a Porsche 911, which is added mostly to hold groceries or a backpack. The rear seats here are very useable, even for grown men or for me, a woman about their size. Ferrari even has a section on its website where you can see that any number of combinations of skis (yes, skis), snowboards, strollers, bicycles, and even guitars and amplifiers can fit in the back. The other thing Virgolin said his colleagues learned after all their research and development using the FF and GTC4Lusso is that “young” buyers like creature comforts — even on “supercars”. To that end, there are 15 different colours of leather hide for the seats and nine others for the carpeting alone, plus three different shapes of seats, 20-inch forged wheels, and more than a few options to have carbon fibre accents throughout. There are enough buttons on the steering wheel to satisfy even the most demanding geek — buttons to change the indicators, start the car, or adjust volume on the radio are present but not annoying. You can add Apple Carplay, a high-power hi-fi system, a true panoramic sunroof, and a computer screen on the passenger’s side of the dashboard if you want to spend the extra money. That brings us to the final clincher that makes this the surprising entry car for Ferrari — the gateway drug, if you will. At US$260,000 (RM1.1 million), it costs US$40,000 less than the GTC4Lusso. You know, in case you want to get your toes wet without cresting the US$300,000 mark.